There are so many ways to love a tree. We welcome you to find your favorite. Through this program, we aim to bring trees to underserved and under forested communities. Scientific research shows a correlation between poor health, low socioeconomic levels, and minimal tree coverage — a correlation that may even affect newborn babies’ birthweights. This project will provide healthy trees and a better quality of life to under-forested communities. The majority of trees for the Healthy Trees, Healthy People program will be planted on private property, as this is where they have the highest survival rate and provide the most immediate benefit. To donate to the Healthy Trees, Healthy People program, click here! Wasatch Back Trees focuses on bringing urban and community forestry services to smaller communities located outside of the “Provo to Ogden” metropolitan corridor. Special attention is paid to helping these communities obtain Tree City USA recognition. Assistance with Shade Tree Ordinance writing, Arbor Day Celebrations and Tree Board development are all components of this effort. Some people adopt children, some people adopt dogs. We adopt fruit trees in need of care. Volunteers prune, remove turf and then add mulch around the fruit trees. In the fall, everyone reaps the harvest. The apples are sorted into A,B,C, and D categories. A’s go to local food banks. B’s are for cooking and baking. C’s are for lucky local animals and D’s are added to local composts. 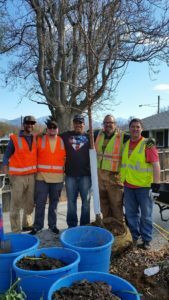 Vail Resorts, Iron Mountain, Miners Cabin, Alliance Residential and local community groups cared for the over 70 existing trees and planted eight new trees at South Summit Park. ReLEAF UTAH and Snyderville Basin Recreation have aligned to plant new trees and care for their existing trees. Care includes removing grass and weeds and laying 2-4 inches of recycled wood chip mulch. ReLEAF UTAH applauds local school children who have adopted more than 3,200 baby trees. We provide the seedlings and education for proper planting and after-care techniques. Since 2007, volunteers have planted over 200 two-inch caliper trees at local parks and schools. Group plantings are fun and rewarding with huge benefits to the community. We deliver a three-class, twelve-hour course to train local citizens to properly assess, maintain and care for the trees in our communities. The Utah Division of Forestry, Fire & State Lands along with several partnerships holds an Annual Arbor Day Poster Contest for elementary aged children. We encourage schools to participate and combine this contest with an educational experience. We work with returned veterans and public safety providers to provide a form of horticultural therapy. The life creating and nurturing activities that are part of arboriculture help mitigate symptoms associated with PTSD.